Rob Cross won a thrilling second round contest at the William Hill World Darts Championship this afternoon (Saturday). The St Leonards-based thrower came from three sets to two down to triumph 4-3 in a match of superb quality against Michael Smith at Alexandra Palace, London. Smith, seeded 13, missed two darts for a 4-2 victory and Cross capitalised to win a match which he ended with 16 maximum 180s and a tremendous 102.65 average. Cross, seeded 20 after an outstanding debut season on the Professional Darts Corporation ProTour, hit two of those 180s in the opening set, yet didn’t win a leg as Smith clinched it 3-0. Smith broke the Cross throw at the start of the second set, but Cross landed a brilliant 164 checkout to hit straight back and then held throw to lead 2-1. After Smith checked out 109 to level at 2-2, Cross produced a strong leg on his own throw to level the match at 1-1. 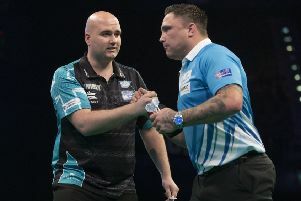 Although Smith took the first two legs of set three, aided by successive 180s in the second leg, Cross reeled off three legs in a row - hitting 180s in all of them - to edge ahead at two sets to one. Smith won the fourth set 3-0, helped by a 116 checkout in the second leg, and raised his already extremely high level still further to clinch the fifth set in just 36 darts, winning the three legs in 11, 12 and 13 darts. Aided by 180s in the first two legs, Cross opened up a 2-1 lead with the throw in set six and then missed two darts at a double to seal the set in leg four. Smith then missed two darts for the match in the fifth leg and Cross hit double 14 to level at three sets each. Both players landed 180s in the first two legs of the deciding set, both of which went with throw. Smith missed three darts at a double to hold throw in the third leg and Cross landed double 16 to win a leg in which he hit two 180s. Cross landed two 180s to leave 44 after nine darts in the fourth leg and was successful with his fourth dart at a double to clinch the set 3-1, and with it the match. Afterwards he told the PDC: “It was weird, from my own performance I felt a bit up then a bit down. I didn’t settle as well as I wanted to, but at the same time I went into that seventh set feeling good. The 27-year-old Cross, who last year was working as an electrician, will face John Henderson in the last 16 on Thursday afternoon after the 29th-ranked Scot upset fourth seed Daryl Gurney 4-2. “You just get to a standard now and you just keep playing like that,” added Cross. “I will need to shape up because in certain sets there I wasn’t brilliant throughout.